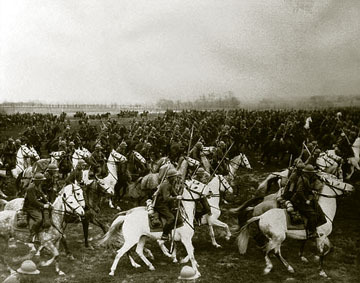 One of the great romantic stories of World War II, is of Polish lancers bravely –and desperately– charging German tanks in the opening days of World War II. Shades of the famed charge of the Light Brigade at Balaclava during the Crimean War, which led a French general, Pierre Bosquet, observing the brave but pointless charge, to remark, C’est magnifique, mais ce n’est pas la guerre: c’est de la folie (“It is magnificent, but it is not war: it is madness”). Apparently, romantic as the tale was, the story wasn’t true: it was a myth created by the panzer commander Gen. Guderian, and spread by the famed war correspondent William J. Shirer; see the Polish-American Journal and The Guardian for details. What is important about the story of the Polish lancers was that it represented the gallantry of a country and a people outgunned and doomed by the relentless assault of an invader. What is romantic, and true, however, is how Radio Poland played Chopin’s Polonaise in A major, Op. 40, No. 1 (“Militaire”) every day, from the start of the German invasion on September 1, 1939, until the city fell on September 27, when “The first eleven notes of Chopin’s (†89) Military Polonaise, the signature of Warsaw State Radio, are sounded for the last time.” Go listen to Arthur Rubinstein’s performance of it. President Quezon broadcasts from the air raid shelter in his Marikina residence on December 20, 1941. With him are Executive Secretary Jorge B. Vargas and Joe Stevenot, head of PLDT. Radio would play a role in the Philippine resistance, too: when the Commonwealth inaugural for the second term of the president and vice-president was held on December 30, 1941, it turned out there was no way to broadcast the proceedings to unoccupied areas. 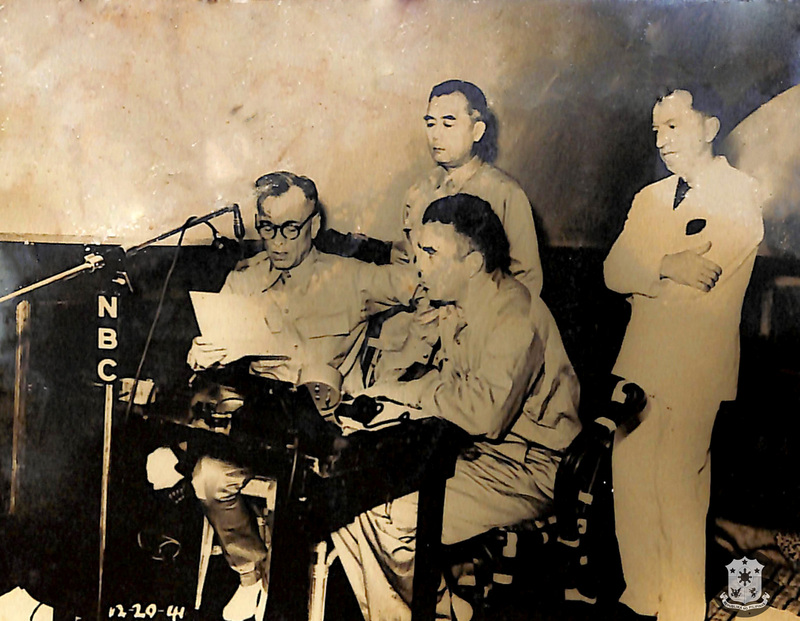 Radio equipment from Manila were retrieved and transferred to Corregidor, becoming part of the apparatus for the Voice of Freedom which broadcast until Corregidor fell on May May 6, 1942. But even as radio played a role, it is the legend of the Polish cavalry that concerns us here –and a parallel story of heroism on horseback from the early months of the war in the Philippines. Delaying actions were fought to permit withdrawal to Bataan, the bloodiest of which was fought by the 11th and 21st Divisions on the Porac-Guagua line. The 26th Cavalry Regiment protected the west flank of the 21st Division. 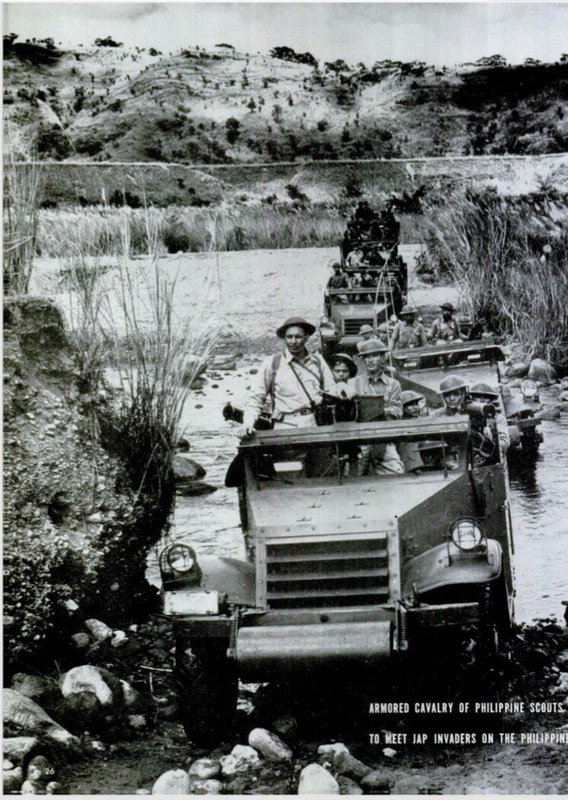 As the entire USAFFE struggled from south and north toward the Layac junction, the only approach to Bataan, the delaying forces held their line on open and unprepared ground. From 1 January to 5 January they stood fast against massive enemy aerial and artillery bombardment, concentrated tank attacks and banzai charges. Casualties on both sides were heavy. 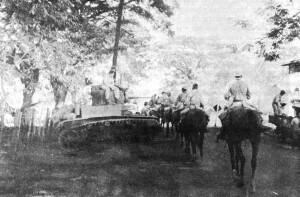 The first defensive in Bataan was the Hermosa-Dinalupihan line, where on 6 January 1942 the 71st Division, the American 31st Infantry Regiment and the 26th Cavalry Regiment fought off the pursuing enemy. Official US Army photo, 26th Cavalry in Pozzorubio. The aim of War Plan Orange-3 was to delay the invading enemy forces until the US Navy could gather together it’s Pacific Fleet and sail to the Philippines, on the way dealing with the Japanese Fleet. But there was no US Navy fleet to gather together, for it now rested on the bottom of Pearl Harbor. The main battle position of the USAFFE, the Abucay-Morong line, was attacked along its eastern flank on 9 January, but the 5th Regimental Combat Team, reinforced by the 57th Infantry of the 21st Division repulsed the attack. On 14 January the Japanese attacked the boundary of the 41st and 51st Divisions. The 43rd Infantry, holding the left lank of the 41st Division, which was reinforced by the 23rd Infantry, 21st Division sharply refused its flank. The 51st Infantry, holding the right flank of the 51st Division, withdrew creating a gap through which the enemy advanced to the Salian River. But a patrol of the 21st division discovered the enemy, and elements of the Division rushed to the Salian River valley where after a savage fight, they repulsed the enemy. Farther to the west the enemy surprised and routed the 53rd Infantry. Penetrating deep behind the main battle position along the Abo-Abo River valley, the enemy advance was held up by combined elements of the 21st Division of the II reserve, the 31st and the 51st Division of the Bani-Guirol forest area. 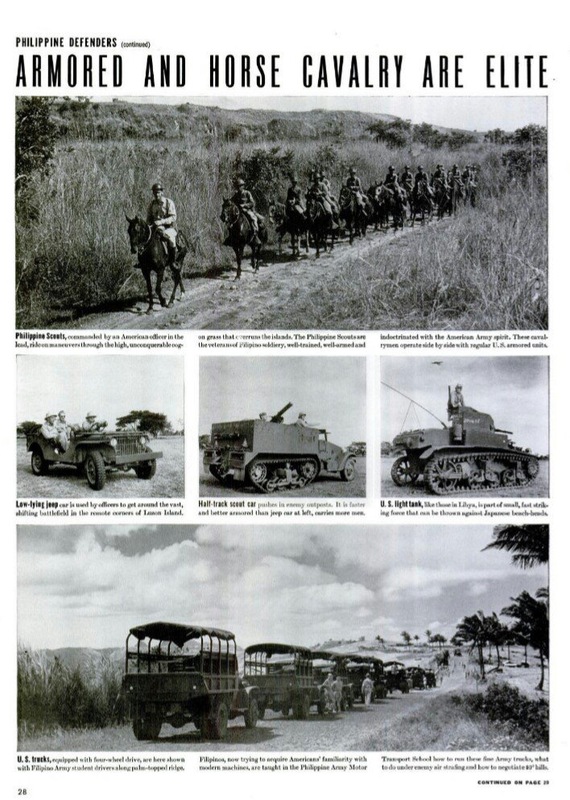 The American 31st Infantry and the 45th Infantry, Philippine Scouts, succeeded in partially restoring the abandoned line of the 51st Division. On 15 January the Morong sector, defended by the 1st Regular Division, reinforced, came under heavy bombardment. But the line held. A few days later, the enemy penetrated through a huge gap in the Silangan-Natib area and established a roadblock on the Mauban ridge, thus cutting off the 1st Regular Division from the rear area. Gravely threatened, elements of the 71st and 91st Divisions and the 2nd Regiment repeatedly attacked the roadblock but failed to dislodge the enemy. Although the II Corps Sector had prevented a similar envelopment in the Salian River battle, the I Corps position was now untenable. The Abucay-Morong tine was abandoned on 24 January. The Orion-Bagac line was established two days later. Again in a desperate attempt to outflank the I Corps, the enemy landed crack units on the west coast of southern Bataan. The aim was to outflank and to isolate the frontline units from headquarters and supplies. There were three ferocious battles in the I.apiay-Longoskawayan Points area, fought from 23 to 29 January; in Quinawan-Aglaloma Points area, fought from 23 January to 8 February; and Silaiim-Anyasan Points, fought from 27 January to 13 February. Of the 2,000 enemy troops committed to these battles, only 34 wounded soldiers returned to their lines. On 27 January enemy troops were discovered in the rear of the Orion-Bagac line, the Tuol River valley behind the 11th Regular Division and in the Gogo-Cotar River valley behind the 1st Regular Division. The series of engagements to eliminate these enemy salients became known as the Battle of the Pockets, fought from 27 January through 17 February. Of the 2,000 Japanese troops committed to this battle, only 377 were reported to have escaped. After the battles of the points, pockets and Trail 2, which were brilliant triumphs of the USAFFE, the enemy withdrew to regroup their forces and to wait for reinforcements. It’s in these encounters that the image of dashing, daring, but doomed cavalrymen seems to have captured the imagination of soldiers and civilians alike. Captain John Wheeler leading the Machine Gun Troop of the 26th Cavalry Regiment(PS)(Horse) just prior to the Japanese invasion. 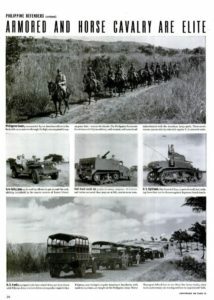 From the cover of the March/April, 1943 issue of “The Cavalry Journal,” published online in the Philippine Scouts Heritage Society website. Heard the 26th cavalry was annihilated in Pozzorubio. They charged against tanks and artillery. An eye witness claims he saw “headless riders charging onward.” Another said that some members of said unit “jumped at tanks, pried open their turrets and hurled grenades.” MacArthur awarded DSC’s to members of this brave unit. Most decorations were posthumous. Buencamino III at the time he wrote his diary entry was in Fort McKinley (today’s Fort Bonifacio) and not in touch with his family; he would soon join the USAFFE withdrawal to Bataan. December 30, 1941 23rd Day of War. The 26th Cavalry of the Philippine Scouts really distinguished themselves. A Lieutenant made the mistake of lighting a cigarette early one morning. An ambushed machine gunner yelled that was the wrong thing to do and they were riddled by the Japanese, losing about 500 hundred mounts, eight officers, and many unlisted men. They were covering the flank. The Philippine Army retreated and left them cut off. They had to take to the mountains around Lingayen and get reorganized. The pressure on Filipino and American troops proved to be tremendous. 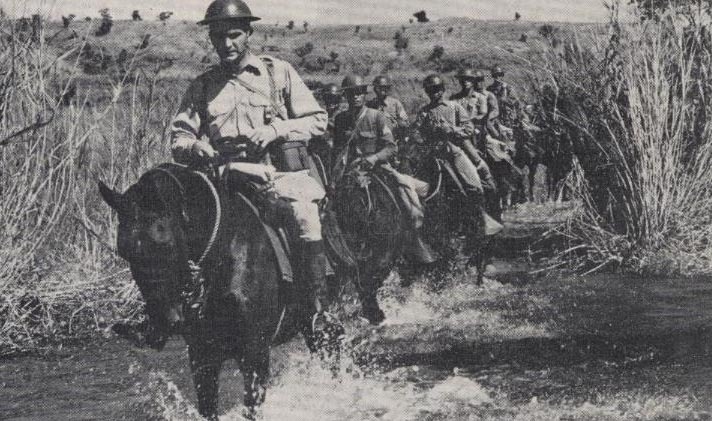 There is January 16, 1942 when, in the vicinity of Morong, 27 members of G Troop of the U.S. Army’s 26th Cavalry Regiment (Philippine Scouts) surprised and charged a Japanese infantry unit– the last cavalry charge of the US Army. You can detect in the official and personal accounts of the military above, that there was resentment on the part of the Americans towards the Filipinos. Filipinos for their part, were aware of this and both puzzled and indignant about what seemed to be a slur on national valor. Those feelings are more fully described in the entry The debate on taking the Philippines out of the war: January 28 to February 12, 1942 on developments at the front, particularly the Japanese offensive in late January, 1942, and how Filipino officers and leaders felt about what was taking place. Finally, a composite unit from the PC, 26th Cavalry, 71st Div, PAAC and even Ateneo ROTC Volunteers annihilated the remaining enemy forces at Silaim-Anyasan Pts. thus ending the so-called Battle of the Points in West Bataan two days ago. And so, Alas and Alackay, I can now say “All’s Quiet in All Bataan Fronts.” Have not seen any enemy plane whole day. Still, the fight would go on. Even after General Wainwright, under duress, ordered the surrender of all USFIP forces in the Philippines, there were officers and men, Filipinos and Americans alike, who continued to resist. 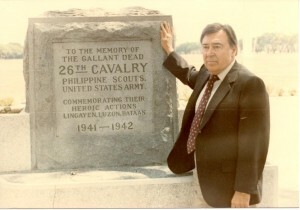 Ramsey, in a photo from his official website, visiting the memorial marker to the 26th Cavalry in Clark Field, Pampanga. But the era of the cavalry had come to an end. A simple marker stands as its monument. Last night about 8:15 three men were seen to crawl under Bldg. #13 by a corps man. Captain Wallace (OD), Captain Bruce and Nasr and myself, investigated and put guards on #13, held emergency tenko and Col Trapnell and Captain Wallace went under the Bldg. A civilian named Gray was missing on the count. Col Trapnell and Captain Wallace found a bucket and many duck feathers and duck heads under the Bldg. Six ducks from the Japanese duck pond have been missing the last two days. the case. The Japanese sentries permitted the search, and Mr. Kuboda came up last night, so I notified him this morning and am waiting for further instructions. Conference with-Captain Nogi yesterday and he took up the “plan” which I had submitted as to how long the present supply of drugs would last the 761 patients at Bilibid, Cabanatuan and Ft McKinley. Also he wished to know total number of RC boxes necessary to box all medicines from all sources in Bilibid. This report is out this date. Request for X’mas carols and mass preparatory to X’mas sent in today. 118 individual mosquito nets issued – 51 for wards, other “sabis”. Had a staff meeting and party at 8:00 PM in honor of the day. Everyone well pleased with dinner. – lugao with corn, mongo beans stew, gabi and camote pudding flavored with eugenol. Sgt Perkins and Pvt Laudin admitted from Ft Drum via Ft Mills with beri-beri and malnutrition.They report bay shows over 45 hulls but no active ships. tobacco or other produce soon. All was procured by 6:00 PM. Had a talk in quarters in the evening by a Captain telling of all the gifts, citations. etc. which we are suppose to receive. Front of stoves caved in this morning. This was inevitable and have spoken to Japanese about 3 times. They report that they have no cement but will try to bring in a couple of truck-loads of clay with which we can rebuild stoves. Death last night, Robert N. Null, S Sgt USMC, ante mortem diagnosis – lymphoblastoms (a biopsy of a node sent to Phil. Gen last week). Post-mortem diag-Questionable carc.-head of pancreas. Burial was at Del Monte Cemetery, Chaplain Taylor officiating. The body was taken out by push-cart. No patients fran Cabanatuan altho the group on the 20th implied more would come today schedules for Ft. McKinley. I regret that they didn’t since they might have brought some more cassava. We have had the latter fried the last two days which is a substantial adjunct to a deficient diet but are now out again. Still on alert. Bldg. #18 personnel moved to Bldg. #11 this morning by Japanese order as they are moving Japanese personnel in #18 and requested 70 wooden beds. Move consumated with minimum of disturbance. Conference with Captain Nogi who wishes a plan showing how long present supply of medicine will last based on patient census of october 31/44 for all patients in Bilibid and at Cabanatuan, and McKinley with a break-down according to disease classification as of that date. 23 mattresses given to field officers in Bldg. #1. There are 52 Lt Cols there, and over a hundred total. All clear at 2:30 PM.